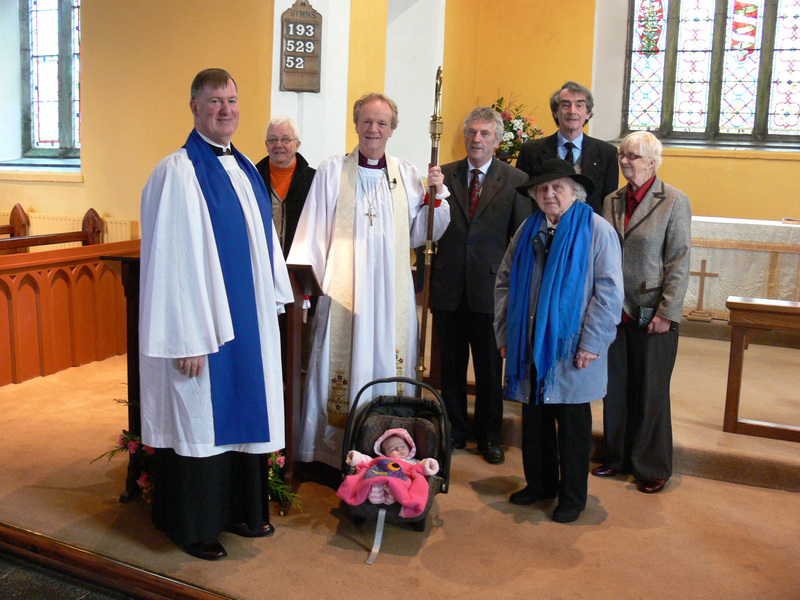 Bishop Patrick visits Kilcummin on Sunday 29th January seen here from the left, Steve Ellis, Bart Wynan, Bishop Patrick, Lilly Lyons (youngest member of the congregation) Leslie Lyons, Phil Furness (oldest member), Walter deLacy and Margaret Larminie. On the last Sunday in January we did indeed welcome our new bishop, Rt Rev. Patrick Rooke, to Kilcummin parish. There was a great turnout to meet him – special thanks to Heather de Lacy who sent e-mails out into the highways and by-ways of the internet to let parishioners know. Trevor Goodbody captured a special moment on camera in the photo here, with the oldest parishioner (Phyllis Furniss) and the youngest (baby Lily, Iris and Roddy Joyce’s very newborn first grandchild) there to greet the bishop. Sorry, Iris – it happened you were rescuing things in our church ‘kitchen’ at the crucial moment of the photo. Our new bishop and his wife, Alison, were very generous in giving us plenty of their time after the service, while we all did justice to the nibbles, as they made their way around to talk to everybody. Bishop Patrick had caught our attention straight away in his sermon, describing how a real pearl comes into being. The oyster or mussel gets all shirty (my words, not his!) and uncomfy when its space is invaded by a bit of grit. The poor oyster/mussel can’t get away, doesn’t even try. Instead it gets to work on wrapping up the intruder in a layer of liquid velvet, to make it livable-with. The oyster keeps on working on it, layer upon layer, and finishes up with the bit of grit that had been annoying it, transformed into something really valuable. It’s all right – I’m not going to re-write all the rest of what he gave us to think about. We know, now, that should we happen to land any “grit” on our bishop, the future is bright for our transformation! We wish Bishop Patrick, his wife Alison and their daughter Suzanna a happy and fulfilling time in the diocese, and we look forward to many more visits, wishing them luck, too, in their quest for river-pearls round about here. Love this picture. Have visited your Church many times while in Ireland and just love Leslie Lyons, Baby Iris (congratulations to Grandma Iris) and also learned to love Phyllis (the lady with the most beautiful hats). Many lovely people there. Hope to meet the new Bishop and will miss Father Patrick but wish him well.